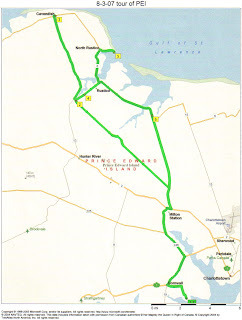 Cornwall, Prince Edward Island and around! 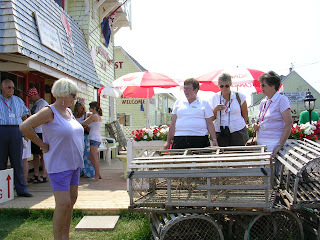 Today we took a bus tour of some areas of Prince Edward Island – took most of the day, and was really worth the time, although the afternoon was rather wasted because we had a HUGE lobster lunch at a great “World Famous Fisherman’s Wharf Lobster Suppers restaurant” in North Rustico (with a 60’ long salad bar – best I’ve ever seen – with a yummy Seafood chowder, steamed mussels and oh so much more) that made every single passenger on the bus nod off on the balance of the trip! What’s more, they had a gift shop that wasn’t the usual touristy stuff – it was really classy quality artsy crafts and paintings. 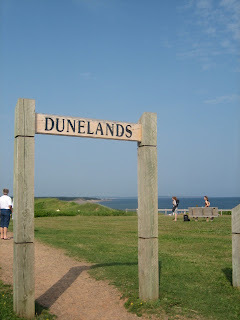 First stop was at the Cavendish Dunelands, a gorgeous stretch of beach, honoring fallen soldiers which is characterized by sand dunes, barrier islands and beaches, sandspits, and associated wetlands. The diverse habitats in the Park provide a home for a variety of plants and animals. The woods and shores of the Park are filled with over 300 species of birds and a large variety of plants. 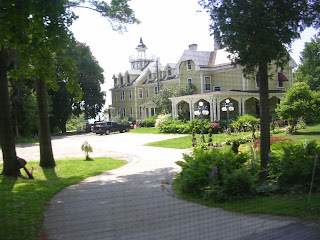 Then it was on to Green Gables, the homestead farm and surrounding woodlands where, (yes, you’re right, Anne of Green Gables) Lucy Maud Montgomery grew up and later wrote the book! Impressive restoration and magnificent gardens here at the Cavendish National Historic Site, commemorating her as a person of national historic significance! 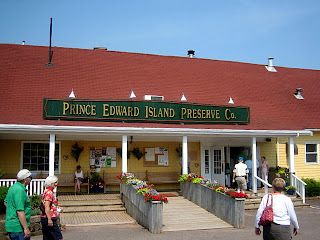 From there we went to a charming spot – The Prince Edward Island Preserve Co. run by a Scotsman who is everything you’d picture, right down to his kilt (except he wasn’t wearing his usual uniform this day, although he did come on our bus personally to greet us and regale us with the tale of his little business. Then we were treated to bagpipe music in the garden on our way into the tasting room. Oh my, what marvelous preserves and sauces and condiments! When Maggie and I were recuperating from the tour in the evening, we saw his TV ads several times, and he does indeed wear his kilt most of the time! Our tour guide today was an attractive bubbly young woman, Tammy, who considers herself an island girl, although by PEI terms, she is actually “from away” since she was actually born in the U.S. (to PEI parents). Seems you’re “from away” even if you’ve lived here your entire life, should you have the misfortune of being born while your folks were on holiday even! And then, of course, there are those “blue noses” from Nova Scotia! Those who are “from here” are very welcoming to visitors and to those who are “from away”, but the distinction is clear. 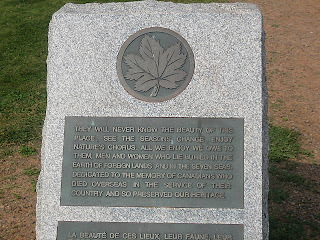 And PEI folks are incredibly proud of their island and their homes and land. All the homes and yards and businesses are immaculate – every lawn looks to have been mowed that very day, but we didn’t see anyone doing the mowing! Tammy said the season has been such that she has had to mow her yard (her husband has, that is) about every 4-5 days!!! This time of year, the island is gorgeous and green – so green, in fact, that the University funded a study recently to determine how many shades there are here – and came up with at least 50 shades of green!! 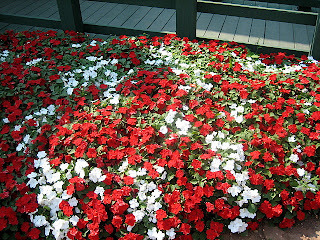 So many types of foliage, so many trees and shrubs and crops – truly a color palette! Plus 25 golf courses to add to the canvas!! Agriculture and Tourism are the main industry here. Crops? There are about 1700 farms on the island, and 450 of them specialize in potatoes. 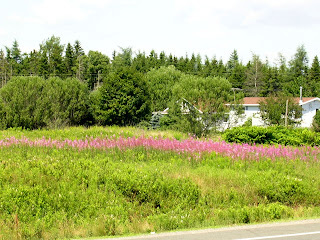 We saw a large plant not long after we crossed the Confederation Bridge – McCain’s – and guessed it to be a food processing plant. We were right – McCain’s is one of the largest! Much of the potato crop is turned into French Fries! We also saw huge fields of bright yellow canola blossoms and soy beans, apple trees and plums. And, of course, lobster and mussels and fish! Maggie and I are doing are best to support the lobster industry! As if they need our help! And mussels are big too - about a $30 million dollar industry, with the majority going to Red Lobster Restaurants! We received a quick lesson in how lobster traps are pulled, how they’re measured to see if they are keepers or must be returned to the sea (the size they look for has a carapace about 4” in length from just behind the eyes to the junction with the tail), females with eggs must be returned to the sea, how the traps are re-baited (using a slab of fish on a stake in the middle of the trap, and returned to the sea. There are usually 6 traps per line and it takes about 8 minutes to process each trap. 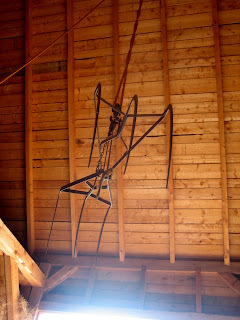 The lobster men are limited to 300 traps each, and amazingly, we learned that most lobster fishermen can’t swim! As Tammy said, I think I’d like at least a fighting chance of surviving if I went over the side. Apparently they figure if they’re caught in a line and dragged down, they’d not get free in time to need to know how to swim. Not a pretty picture! It’s back breaking work, and the season is only a few months long (about 8 weeks, then a break while the lobsters molt, then another 6-8 weeks), but on a good day they can make about $13,000, so I guess a couple months is enough. They rarely get a big lobster – they’re supposed to throw them back if they do. Long day with lots of information to process, and Tammy did a great job of making it all fun! A Prince of an Island! Beautiful day to be on the road! 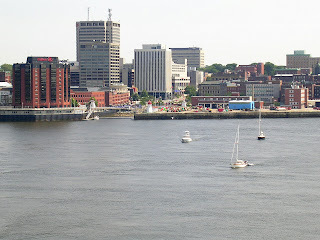 We paid a little more attention to our surroundings as we left Saint John this morning. After crossing on the ferry again (this is getting easier each time!! 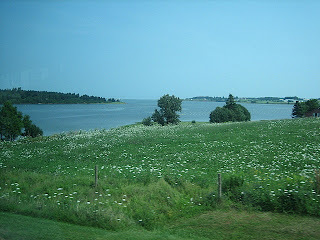 ), we enjoyed a bit of the countryside and the city, which is quite picturesque and pretty! The fellows operating the ferry were delightful. I hadn’t been able to retract my steps into the coach since the Customs people had searched the vehicle. As we found out a couple days down the road, they had dislodged the connection switch which operates the steps. But the guys on the ferry were so concerned for us that on the four minute ride across the channel, all three of them were under my coach trying to get the steps to work. Sweet! Between Meg and me, we’ve probably taken at least 50 pictures of church steeples – every little town and village has at least one sparkling white church amidst all the heavenly green trees, with tall pointy Gothic steeples or the boxier Romanesque steeples, late Byzantine – some had red accents, some green, some gold. I love ‘em all! Miles and miles of undulating hills covered in multiple shades of green – darker firs and lighter deciduous maples and oaks and many more I can’t identify – with clear-cut paths for the huge power lines. As in Mexico, the tall power lines make perfect homes for the osprey, as we saw dozens of huge nests up high in the towers. We passed thru Salisberry, Home of the Silver Fox! As we headed northeast out of the Moncton area, we noticed that more and more of the billboards and signs were showing French descriptions either before English, or instead of English. Hurumph! Passed a “Car Life Auto Museum” – obviously a project of the owner, with old gas pumps and signs and several antique tractors outside, as the draw to whatever goodies he had in a large garage. One of the coaches in our group broke down today. 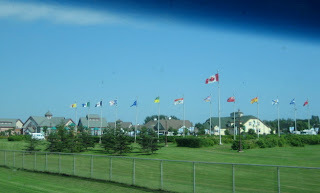 We passed them on the road just before heading onto the Confederation Bridge to Prince Edward Island. This is one big bridge – impressive engineering. 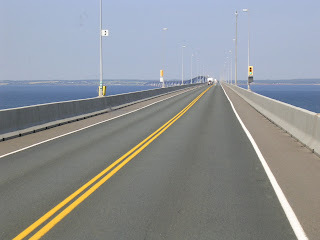 A little over 9 miles long – not a suspension bridge – over the Northumberland Straits. It’s the longest bridge in the world, opened about 10 years ago. 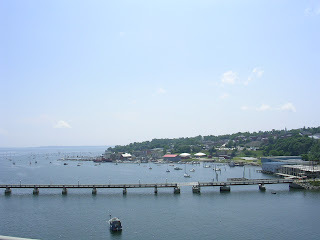 It took nearly three and a half years to construct, and eliminated the need for a car ferry as the only access to the island. Which was not really like me, especially because St. Stephen has a Chocolate Museum of some repute – but they didn’t have the opportunity to entice me – I just wanted to get away before the cops changed their collective minds! 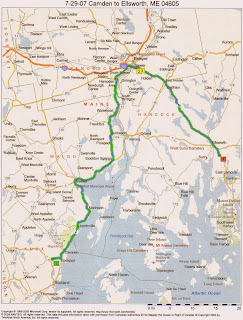 I will say the roads in New Brunswick are so much better than Maine’s roads that it was like moving from a bed of rocks to a Select Comfort mattress! That helped my mood! 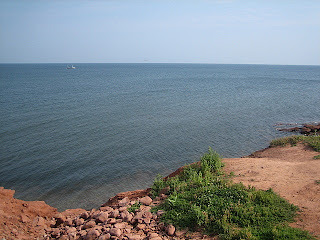 New Brunswick is water bound on three sides and has several natural harbors – one being their side of the Bay of Fundy, famous for its phenomenal tides, sometimes reaching a change of 52 feet!!! The province is heavily forested, and as such presents that incredible palette of green colors that I love so much – so many colors, so many different trees, so beautiful!! 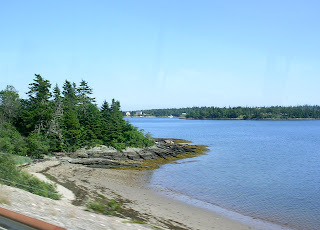 Forestry and the products of the sea are major sources of income for New Brunswick, but tourism is the number one “industry”. 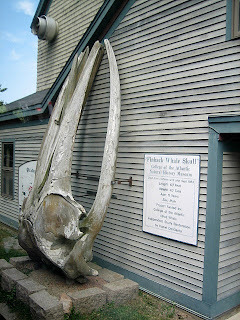 Which says a lot since they have a relatively short visitor season! The climate here is classified “humid continental”, to which I’ll attest! As in MUGGY!!! Which of course means mosquitoes!! Hungry mosquitoes!! 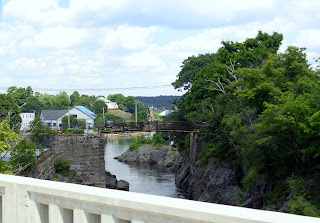 We missed out on a tour of Saint John today, of course, and a visit to the famous Reversing Falls – a unique water fall caused by the tremendous tide in the Bay of Fundy – an underwater ledge, 36’ below the Falls causes the rising tide to slow the river current to a stop for about 20 minutes. When the tide is higher than the river, the reversal of the current occurs and water rises up to about 14 feet. This action happens at both high and low tides, and sounds so special that I may return to see it myself! The last bit to the day was to drive onto a tiny little ferry to cross a finger of the sea to the island where our RV park was located. 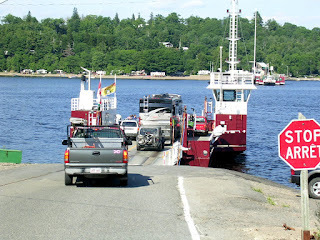 Just what I needed, but having experienced an even smaller ferry last summer at Dawson City, this was turned out to be a snap! I was so beat up after the previous day’s ordeal, that we opted not to go to the groups evening meal, but one of the gals was sweet enough to bring us our dinner – which considering the time involved, was quite good! Nice to have a peaceful night’s sleep!!!!! Except for my extremely traumatic occurrence late in the day (if you haven’t seen it yet, check the posting for 7/29/07), it was a lovely day! Charming little towns and villages and beautiful rolling hills, planted in a variety of crops presenting lots of colors. Passed the Worcester Wreath Co. building in Harrington, ME – a company that those who know me will be familiar with – the fellow that owns this wreath company is the one who places wreaths on all the graves at Arlington, and many more cemeteries now, in honor of our servicemen and women who have died for our country, every Christmas season! He has a huge Christmas wreath on the side on his building! We stopped at the White House Restaurant, just outside Jonesboro, ME, for a terrific home cooked meal – one of the best I’ve had on the road, ever! My visit with the law rather spoiled the rest of the day, needless to say. 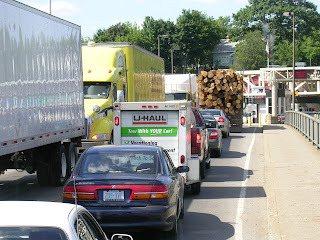 We had already been questioning this particular crossing into Canada from Calais, because it is extremely poorly planned – very crowded, tight turns, one lane each way, with new construction causing the 18-wheelers to have to practically do calisthenics to make it thru, as the roof line is too low for them to maneuver under! It went downhill from there. The day was to begin early with a “Whales & Puffins” tour aboard the Friendship V out of Frenchman Bay at Bar Harbor, but unfortunately the fog was so heavy that the ship couldn’t go out. 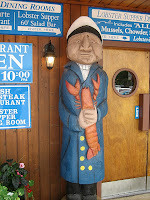 We were already in town, so we were able to wander the streets and spend some money prior to a fantastic lobster lunch at the Fish House Grill! Wishing then for a nap, we were bussed on a two and a half hour narrated tour (where I learned, among much other fascinating stuff, that the North is considered ‘down east’) of Acadia National Park – a spectacular park of more than 50 square miles, with panoramic views of the part of the 3,478 miles of Maine coastline. 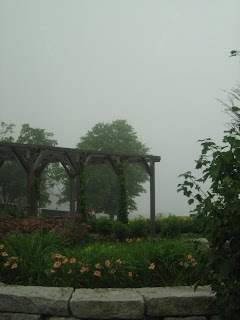 Except that again we could see little due to the heavy fog, which all the locals said was unusual! 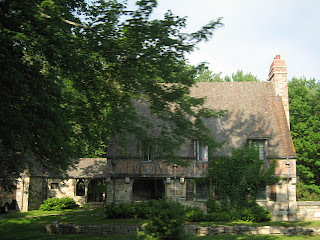 I will throw in a few extra pictures, because what we could see was pretty special, like this home! 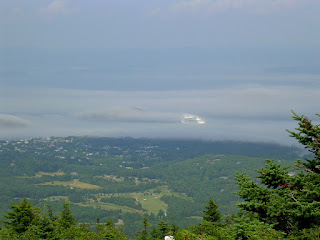 And looking down on the harbor from up in Acadia National Park, this shot of a cruise ship peeking out of the fog was kind of eerie! Oh my goodness, I’m way behind in my travel blog! As I start this update for the 29th of July, it’s actually the 7th of August, and I’m in Nova Scotia! 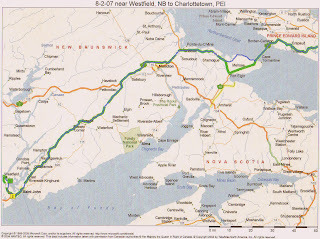 The Good Sam Caraventure tour to New Brunswick, Prince Edward Island and Nova Scotia has kept Maggie and me very busy. That plus weak or non-existent internet connections give me ample excuse to be so far behind. Unfortunately there is another reason, and it’s amazingly enough not another repair to my motorhome! Take heed, my friends on the road, and strangers too! The Canadian border has become quite unfriendly! They are pulling more and more RVs over for full inspections, and I drew the short straw. I refuse to declare all my liquid refreshments, simply as a matter of principle, but that wasn’t my downfall, although they did clean me out. Last year some time, I had received a can of pepper spray from a U.S. Border Patrol friend who was concerned for my welfare on the road. I tossed it in a cupboard and truly totally forgot about it. The Customs folks, of course, found it. I was arrested on the spot. I spent most of the night in a jail cell, had to come up with three grand, as in three thousand dollars, to get my coach out of hock and pay assorted fines. Thankfully, about 1 a.m., they decided I didn’t really seem to be the criminal type, so they released me, on a $200 bond and a promise to show up in court the next day (same day, by then!). They showed me where Maggie and I could park for the balance of the night, in the Tourist Information Center parking lot. Took about an hour to get the coach back together enough to drive over there to catch a couple hours sleep. When I went before a judge in the morning, he as much as told me that Canada was simply retaliating for the poor treatment Canadian citizens are receiving at our border. They were “kind” enough to not charge me with "smuggling" in an illegal item, just for not declaring it, and issued me a “conditional discharge”, meaning that if I stay clean in Canada for 6 months, my record will be cleared. Unfortunately Immigration was not so kind. They are showing “zero tolerance” (their words) and said my criminal behavior meant that I was to be deported and permanently barred from entry to Canada! I begged for mercy, saying my only living relatives are in B.C., plus they were aware of the tour I was part of. So they allowed me to purchase a “temporary resident visa”, so I might continue with this tour. Huh? Permanently inadmissible, but I can buy a temporary resident visa? Oh well – at least Maggie and I can continue the tour, although I’m loathe to do so at this point. But I wouldn’t be able to get our money back, so onward we go! And, by the way, it's before whatever legislative branch, to search each and every RV as it enters Canada - not that it would cut down on visitors or anything. Sooooo, enough whimpering – it did put a serious damper on our moods, and Penny is still suffering from it – her princess constitution did not react well to all the stress – but we’ll all survive it. Thankfully, my awful memory will allow me to put it all behind me in fairly short order. There isn’t going to be much in the way of history or other miscellaneous stories for the next few days of entries, while I try to get caught up! The 29th, itself, was grand. Meg and I had a lovely visit with her daughter-in-law’s family for a couple days before heading north. 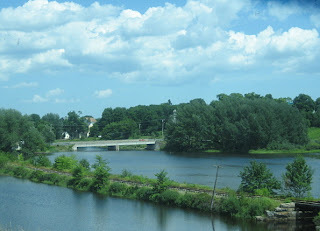 The drive up into Maine was everything it should be, and we were able to enjoy it at our leisure, since we had such a short distance to go to meet up with the tour in Ellsworth. Classic New England in every way… Victorian homes with lots of almost frilly detail and shutters beside the windows, Georgian homes of precise symmetrical design, prim and proper and immaculately maintained. Salt box construction with cedar shingles. Adirondack chairs in the immense front yards to enjoy the passing of neighbors and life! Lots of water, so lots of bridges, and I'm a sucker for bridges as well as flowers and church steeples, so Maggie was kept busy! 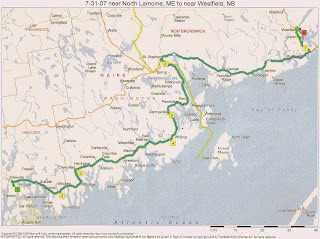 Meg tells me the three northeastern states, Vermont, New Hampshire and Maine, in the area above the White Mountains, have often spoken of forming their own “northern kingdom”, as they consider themselves enough different from the rest of the nation as to deserve unique status! And it’s commonly accepted that the first crop of the year is rocks, as that is what shows it’s head first each spring – the large rocks littering the otherwise rich fields – easier to leave in place than try to move! And more really fun names – The Cat’s Pajamas B&B, Yankee Stripper Hardwood Furniture Shop &; Repair, Pippy’s Seafood and Ice Cream Drive-In! And lots of black-eyed susans and orange day lilies growing wild on the side of the road. Except for the nasty mosquitoes that patrol the area, and the abominable winters (abominable to me!! 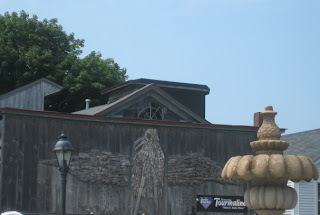 ), this area is absolutely beautiful!! Arrived in Ellsworth to meet up with our tour and traveling companions – 21 rigs of all shapes and sizes, including one gal traveling on her own. Lots of doggies for Penny’s enjoyment too!